Our last steps are mapping out the wire frames and layouts. 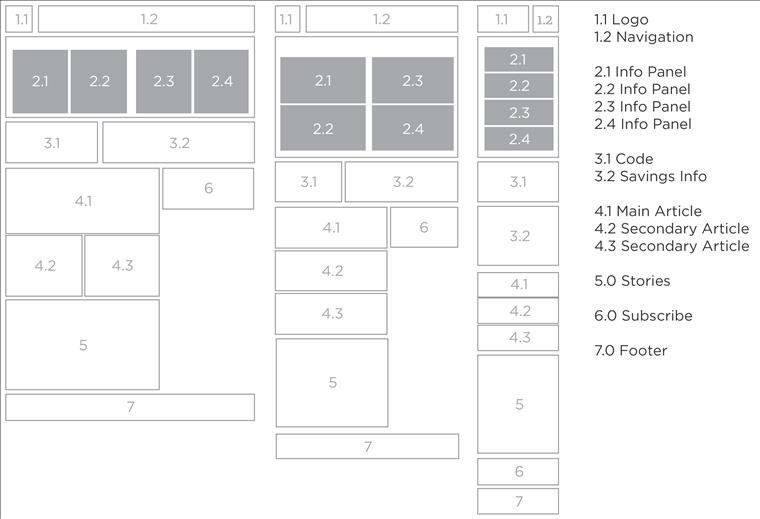 Basic gray and white boxes numbered according to content gives us a quick look as to where everything goes and organizes any edits we need to make. From there, it’s easy to make decisions and begin coding the viewport, the visible portion of the webpage, with the appropriate HTML metatag. Devbridge is aware of hurdles and challenges like browser compatibility and loading times when designing a responsive site. Our initial consultation starts with a discovery. We evaluate content and establish objectives for various devices to create a hierarchy of how and what will be displayed on small, medium, and larger screens. Let’s chat and see how we can pave a roadmap to create a responsive website for your organization. After all, RWD works for selling coffee (Starbucks), promoting a presidential candidate (Obama) and even software (Microsoft). It’ll probably work for you, too.